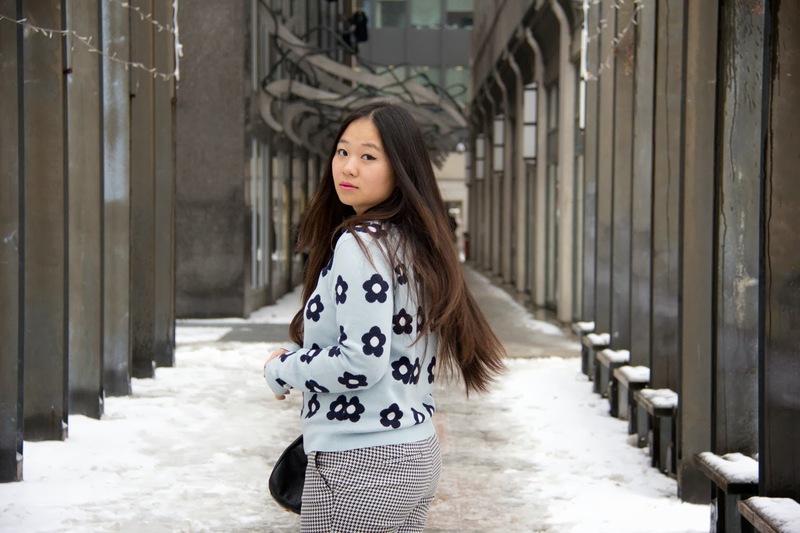 In today's post, I paired this lovely JoeFresh flower print sweater with black-and-white print pants from TopShop to create a business casual look that is perfect for an interview or an internship. Some of my friends asked me what to wear for an internship in a more creative and laid-back environment. My answer to them was wearing something that is comfortable, professional, yet will stand out. Although I haven't gotten any compliant from them...(yet), I now realize how vague my answer was. SO, I'd like to share some unspoken rules here that are based on my personal experience. 1. There ARE different dress codes for different professions. 2. Go easy on accessories. I know you'd love to put on a sparkle necklace to give your look a little more polished feel, you want to show off the beautiful earrings that you just purchased, or you really into that statement hairpin you got from a friend, but trust me, this is not the right time to show your accessory collection. Don't get me wrong though, you for sure still can show your personality with some low-key accessories. Just remember to keep it simple. Some people think wearing black from head to toe is the way to go. I can't say there is anything wrong with the idea. But you should still stand out with some pop colours, especially when your goal is to work in a creative environment. You want to tell your future employer or boss that "although I'm very professional and diligent, I am also a fun and easy-going person to work with." However, you may want to avoid colours like hot pink, neon, and etc. 4. Don't go too crazy on the heels. I personally think midi-heels are the best for an interview or internship. First of all, it provides you with a little lift that you need both physically and mentally, yet shows that you are also down-to-earth. Secondly, a 5 inches killer heels might just end up killing you and your opportunity. Plus, if you are an intern, you might have to run around making coffees or copies, so do you really want to wear a pair of pumps that makes you uncomfortable and affect your work flow? 5. Lay off on perfumes. This one may have nothing to do with outfits, but definitely is one of the key elements that many interviewees or interns often forget. Of course, you want to smell nice and fresh, but a strong scent could really be a turn-off. What if it's one of the smells that your boss hates? What if its the kind that your interviewers are allergic to? You really don't want to give your future employers an excuse to dislike you. My little trick is washing your hair with some lovely smelling shampoo. Has someone asked you about the perfume you are wearing, but actually it was the shampoo that you used in the morning? Yep, you get what I mean. Of course, the longer you work in a company, your colleagues and bosses will have a higher tolerance towards what you wear, because now their judgements on you are no longer only based on your appearance and outfits, but their attentions are more focus on your work performance. So then, you can be more creative and fun with your daily outfits. Fresh Start with A "Smile"